Having brought a puff pastry-powered bromance to its logical conclusion, chef Taichi Hara and pâtissier Yuichi Goto teamed up in 2015 to open Path and the duo’s bistro-café has already become a sensation in Shibuya’s Tomigaya. After a spell together at the Hyatt Regency hotel’s Cuisines Michel Troisgros, Hara left to open Bistro Rojiura in Shibuya, while Goto went on to become the first Asian chief pâtissier at Troisgros’s flagship restaurant in France. Reunited they’ve ditched the formal white tablecloths and starched chef’s coats and made Path a laidback delight. 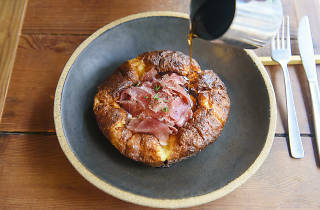 The perfect hangout before or after a day out in Yoyogi Park, Path serves breakfast and brunch – including their famous, super-fluffy dutch pancake (a culinary term rather than an actual Dutch pancake; otherwise our resident Dutchie would firmly disagree on its provenance claims) – from 8am to 2pm. 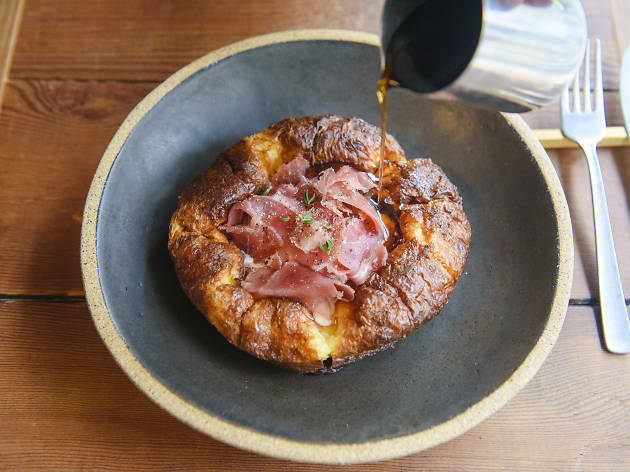 Get there early to secure a seat and wait around 30 minutes for this oven-baked delicacy, topped with uncured ham, burrata and copious amounts of maple syrup, to appear piping hot at your table. And we do mean early: its popularity means that there may be a small queue before the 8am opening. At night, you get to pick from natural wines, Kyoto-made craft beer and rare liqueurs to complement the beautifully plated Italian cuisine, all in a delightfully laidback atmosphere.